Okay, so it's August already and I have actually made fantastic progress on my wish list of summer reading... and managed to read more than a few others! Here's a roundup of my thoughts. 1, 2 & 3. 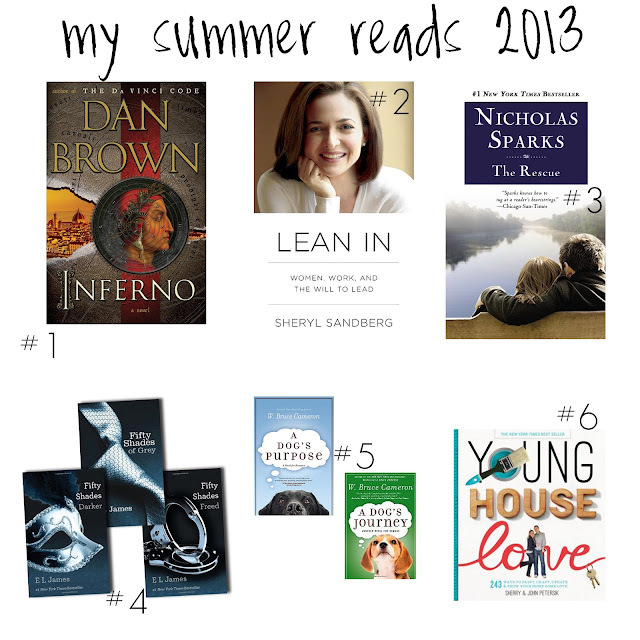 Inferno by Dan Brown , Lean In: Women, Work, and the Will to Lead by Sheryl Sandberg and The Rescue by Nicholas Sparks - Already reviewed here. 5. A Dog's Purpose & A Dog's Journey by W. Bruce Cameron - I was planning on reading this after the Fifty Shades Trilogy but then my parents lost their 8-year old English Bulldog Daisy and I just couldn't bring myself to start it right away. I hope to pick it up this month... but definitely waiting for the mood to strike me. 6. Young House Love by John & Sherry Petersik - It was good. Lots of projects which gets you thinking about your own house and what you can do to bump it up a notch. I read their blog almost everyday and this didn't disappoint. One of those rare ones where it would actually be better in hardback than on my e-reader. I would like to mark pages of things I want to go back and try! Lots to read, lots of info. Definitely worth taking a look at if you are the home improving type. Can You Keep a Secret? by Sophie Kinsella - I'm a big fan of all her books... I hadn't read this one yet, so I snuck it in. It was interesting.... I truly hated the self-absorbed, non-stop inner dialogue of the main character/narrator the first 30 or so pages. But once I got into the story and that was the point of the beginning, it was soooo GOOD. I loved the banter back and forth between her and the guy she met/fell in love with. Another Kinsella book I loved and definitely recommend! Southern Road Series by Stephanie Bond: Baby I'm Yours, Baby Drive South, Baby Come Home, Baby Don't Go and Baby Hold On - I really enjoyed these. Funny, witty and quick reads, set in a small mountain town of Georgia that is being rebuilt after a tornado leveled the place. Great for the beach, the airplane or just a quick break. ;) I think I might be missing the newest novella, Baby I'm Back, so I'm checking my Nook for that one next weekend! Not sure what is up after A Dog's Purpose, A Dog's Journey, Baby I'm Back and Love a Little Sideways, but I have also been wanting to read Wild: From Lost to Found on the Pacific Crest Trail by Cheryl Strayed and The Surgeon by Tess Gerritsen (first book in the Rizzoli & Isles series - love the tv show)... guess we will see what makes the next round. So I definitely have been giving my Nook a workout.... 22 books so far since June 1st! Any good must reads out there that I'm missing?! My to-read list is an 8-page document (single spaced) and it grows just about every day. Adding a few of your recommendations to my list!